Omega 3 fatty acids are one of the most studied nutrients. Combined with highly bioavailable curcumin, this powerful blend supports heart health, inflammation, and brain function. 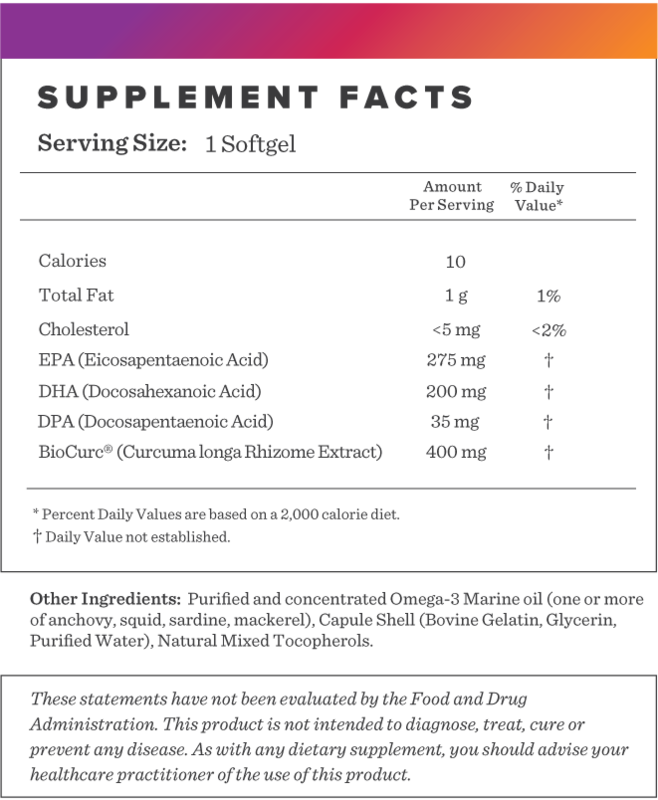 Omega w/BioCurc® contains highly potent curcumin and pure Omega 3 fatty acids. This powerful combination works synergistically together to benefit the body and brain by promoting normal inflammation levels. Turmeric has many health benefits, but it can be difficult to absorb. 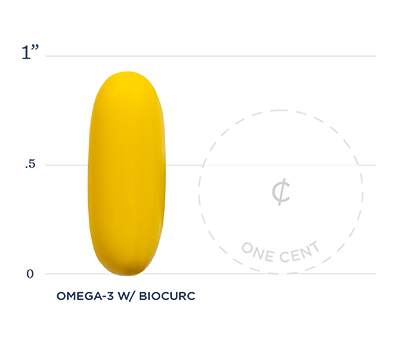 Studies show BioCurc® to be 400 times more absorbable than unformulated 95% curcumin. Our fish oil comes from the icy waters off the coast of Norway and contains a blend of anchovy, squid, sardine and mackerel, is tested for purity, and contains DPA, a rarer find in omega-3 supplements. 1. Pandaren sudheeran S, Jacob D, Natinga mulakal J, et al. Safety, Tolerance, and Enhanced Efficacy of a Bioavailable Formulation of Curcumin With Fenugreek Dietary Fiber on Occupational Stress: A Randomized, Double-Blind, Placebo-Controlled Pilot Study. J Clin Psychopharmacol. 2016;36(3):236-43. 2. Amalraj A, Pius A, Gopi S, Gopi S. Biological activities of curcuminoids, other biomolecules from turmeric and their derivatives - A review. J Tradit Complement Med. 2017;7(2):205-233. 3. Kunnumakkara AB, Bordoloi D, Padmavathi G, et al. Curcumin, the golden nutraceutical: multi targeting for multiple chronic diseases. Br J Pharmacol. 2017;174(11):1325-1348. Below we've broken down the main functions of our Omega-3 w/ BioCurc® and the benefits it can provide. Highly absorbable curcumin, the active constituent in turmeric has been shown to support cognition and learning (1). Our Omega w/BioCurc® supplement fights general aches and pains by promoting normal inflammation levels through it's powerful antioxidant activity. Research shows it to exhibit anti-inflammatory activity through the suppression of numerous cell signalling pathways. BioCurc® has been shown to be effective at maintaining normal healthy brain structure, and support a normal healthy mood.